Fri, Oct 21, 2011. Hi Ron. The video is real time. She's going pretty fast. 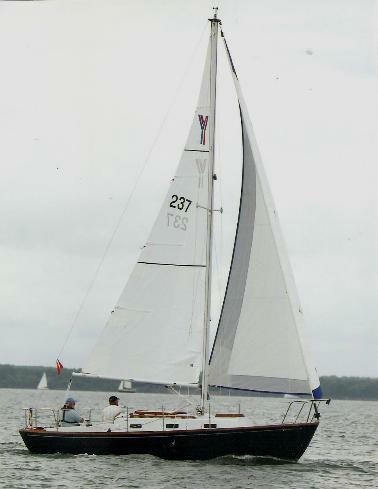 I think it's the full-batten mainsail, a custom job from North. It maintains a pretty efficient shape, and it's a dream reefed down in a blow. The vang helps. Though the full batten is a good way to add some roach, the usual side-effects of this extra square footage up high -- weather helm or skittishness in the tail -- don't seem to be issues on Aspara. If the water's relatively flat, and there's 8-10 knots of wind, she just scoots. I don't know why. I just love the boat, though; I really do. Doug - This is also my experience. My main has long battens, not full, and a high roach. In flat water, up or down wind, not so much reaching, she is really fast. Occasionally, I race PHRF against boats with ratings as low as around 160 - Marionette has a 252 spinn rating. If the breeze is light enough so that she and the other boats are not pushing their 'hull speed' limits - usually this means pretty flat water - she sails to a higher % of hull speed than the competitors do. So, in these condition, we are almost unbeatable, baring a bonehead tactical decision. Ratings aside, she can sometimes beat these bigger boats - boat for boat - boats like C&C 30, Tartan 34, Beneteau 30 and Ranger 26. Besides good sails, especially a large main, I think her hull shape must be very efficient with only a slight or no heel. Oct 23, 2011. Ron, I think you're on the mark regarding keeping the boat flat. I love to sail Aspara on her ear, with a tuck in the main, and the jib furled nicely. In the winter here we get here (20-25 knots). I think the boat is fantastic on these days. I'm from the central coast and we only know days like these, so it's a lot of fun. The truth is, she really goes fast when she's flat, when the wind is ten knots, and the roach on the main gives her some lift without torquing the tail and tweaking the rudder. Stan Secora's 140% genoa. Stan (JATO, Marscot/O'Day #7) passed away earlier this year. He was a marine architect, and avid racer in his Dolphin that he bought new in 1960. Locally, he was a friend to many sailors and a 'technical advisor'. 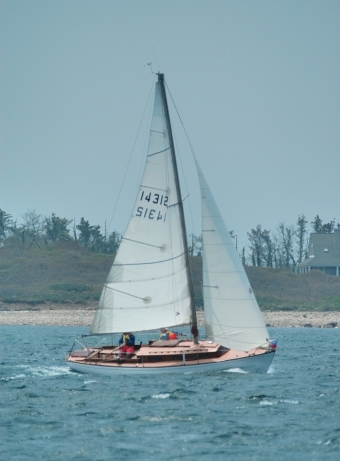 Here in Long Island Sound we often have light conditions until the sea breeze comes in - some times, it is a reefing breeze. He told me his favorite sail was his 140% genoa. In a building breeze he liked to progressively reef, then double reef, then drop the main entirely, sailing on the 140 alone. Here is JATO and her perfectly trimmed 140. 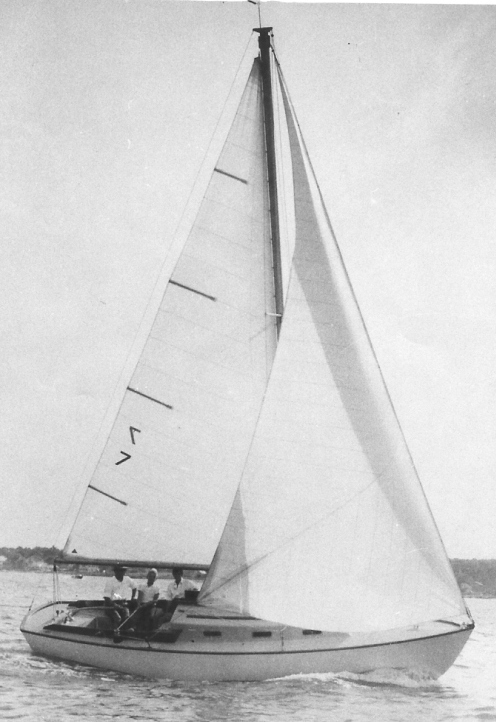 Marionette's 'Blade' sail. When the breeze is up and likely to get stronger, and there is a lot of upwind work ahead, the crew on Ron Breault's Marscot/O'Day #12, Marionette like to go with an old jib from our Atlantic, Relish A-91, a heavyweight cloth sail, about 7/8ths height on the forestay, with short battens. This sail has to be rolled up, not bagged. 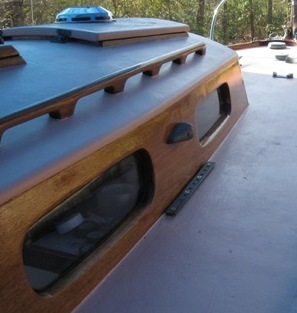 The sheets lead to a short track inside the shrouds right next to the cabin trunk in line with the mast. Despite its age this sail has a beautiful shape and tacks inside the foretriangle. The windward sheeting traveler is fairly wide and we play it a lot in the puffs, letting it down to keep the boat on its feet.. 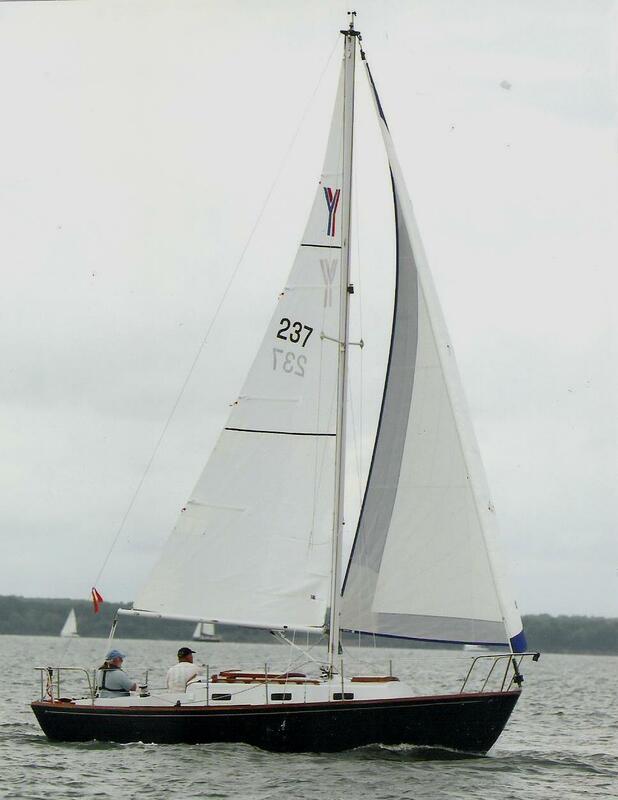 This combination of full main with eased down traveler and blade jib keeps the boat moving fast and pointing, delaying the eventual reefing and depowering. July 26, 2012. A recent request for information/comments on sailing up wind in a heavy breeze under main alone prompted the following response from your webmaster. It follows the line of thinking expressed above. Thanks for your email. The old timers raced Dolphins with 5 in the crew (crowded) so going to weather in a breeze they could have rail meat to hold 'er down. These days, we typically are short handed when sailing our Dolphins. Personally, at this point, I think we would/should have started with our smaller blade sail, about 7/8ths of the fore triangle (picture above left) . When I am by myself or short handed, and expect the breeze to pick up I start with this smaller sail. We don't lose much and the mental comfort level makes up for any lost speed. We had, on an earlier boat, a 140% heavy weight jib that was 'reefable' from the cockpit. 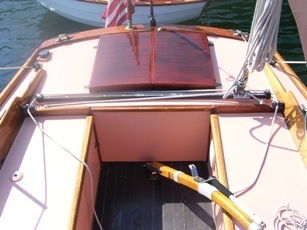 The jib halyard was led back to the cockpit, a line tied to a tack grommet about 18" above the normal tack grommet and led through a block shackled to the stemhead fitting, and led back via another block shackled to the starboard chainplate fitting to the cockpit. We used a double set of sheets with the second set led to a clew grommet maybe 4' up the leech of that jib. We then could reef the jib as necessary. If typical conditions in your sailing area lead to 25 knots or so later in the day, then setting up the boat for jiffy reefing from the cockpit would be well worth the effort, and the relatively nominal cost. March 22, 2013. We received an email from Larry Duthie (Thistle, Yankee #99) part of which had some questions on how we race/trim Marionette. Our answers are somewhat repetitive to comments above, but may be illustrative. Here is Larry's email - excerpted, and your webmaster's replies. P.S. And any other advice you can pass along would be nice. First question from Larry: Before stepping the mast this year, I think I need to bend the arms on the Windex out so I can use it for more accurate tacks. The angle between the arms is now less than 90 degrees (probably about 75 degrees). I'm thinking that a 90-degree spread would be better -- but your thoughts on this would be appreciated. Reply - My Windex - 90 degrees is fine - it makes us feel good to know its there, but is really only used downwind when the wind is really light and up high, maybe not yet down on the water. Tight upwind tacking angles, assuming the jib leads and traveler positions are the same on both sides, are based on flowing telltales on the jib and main luff and on leaches. Outside jib tell tales flowing straight back, inside flowing with a slight upward tilt. 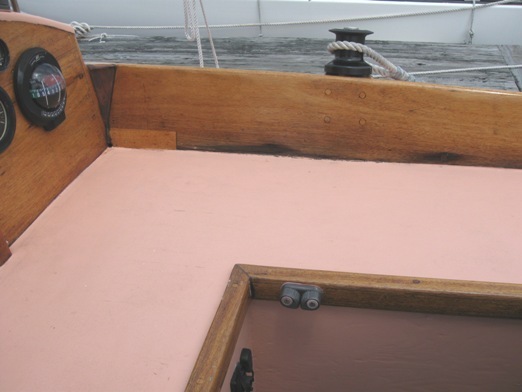 Trim the 140 or 170 jib about 1.5 inches off the spreaders, easy leeches, no cupping, no flapping either; jib luff tension tight but not too tight - softer if really light; when in doubt, softer; main on centerline, traveler eased as necessary, and also in puffs to keep boat 'on its feet' and avoid 'weather helm'. Unless its really blowing (and when it is, reef early) outhaul and cunningham/downhaul snug but not too tight, vang eased - a full main is a good thing, a really flat main does not give enough drive. Point high in flat water, drive off a little in light chop, more in heavier chop; Do what you can tactically to avoid heavy chop in a strong breeze - slow. Reply - Tough one single handed - bigger jibs like to hang up on the new leeward shroud - crew walking it around helps a lot. Don't 'undertack' - that's slow - better to tack into a slight, tight reach, bringing in the sheet by hand until too hard, then get the boat moving and trim in once boat is settled and coming up to speed. Before you tack bring the traveler up to the centerline - re-adjust after the tack is completed. Marionette's set up for jib sheets for single handed, and crewed, tacking works really well - 2 cam cleats set up in the inside edge of the cockpit seat. The sheet lead comes off the winch and you just pull it down to the cleat. And third question, any advice on trimming -- both upwind and down (and reaching for that matter) -- would be appreciated. Maybe a better way to say this is that in light winds a Dolphin tends to sail to a higher % of her theoretical hull speed than bigger competing boats - ie., C&C 30, Tartan 34, Pearson 30. As the breeze builds the Dolphin approaches hull speed and that advantage disappears. If all boats were sailing at exactly their hull speeds, then we'd all finish tied on our rating time. Also, the type of handicap is important. TOD Time on Distance is typical PHRF handicapping, and tends to favor faster boats in short time courses, stronger breezes; TOT Time on Time handicapping attempts to level the playing field - some say advantages slower boats - light air means longer race times, - We like TOT!!! Tactically, in 'our conditions' sail conservatively, don't make mistakes, watch the tell tales, don't stall - sail fast, don't tack unless you have to, stay out of the corners - unless you absolutely 'know' the breeze is filling in from the left or right. Don't take flyers, unless the conditions are not 'Dolphin conditions' and then you may as well take a shot. On a light air day and a 15-18 mile race, if they can see you in the distance as they cross the finish line, they lost!!! 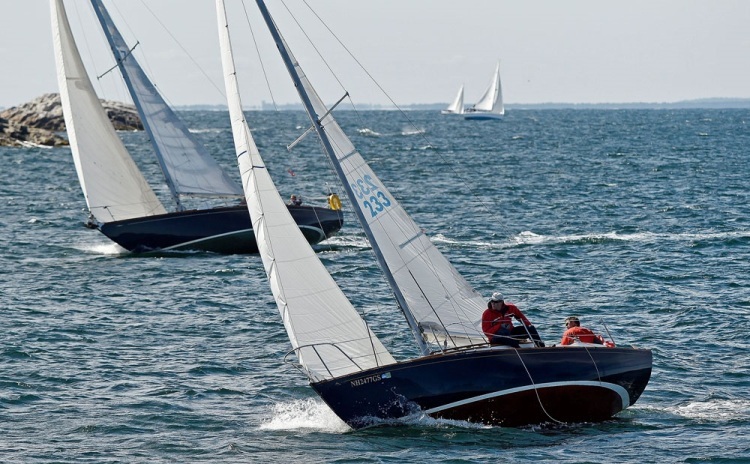 Ps clean, smooth bottom and board; don't worry about winning the favored pin or boat end on the line; try for a clean, good boat speed start near the favored end; stay out of tacking duels - tacking is slow. Keep an eye on the guy who usually wins - where is he? Pps Don't forget, with board up Dolphins draw 2'10" and can get in close where bigger boats can't go. With an onshore light breeze and a lee high shore the breeze often lifts/accelerates as it needs to clear the higher shore. This is a sometimes double benefit, you can sail a shorter course than the bigger boats, and you get a bit better breeze. Great advice, Ron. thank you. Nothing like experience to fill in the blanks. Your advice on tacking is really appreciated. Your tips, although free, are valuable and will get put to use. And if I do well, I'll let you know. We will be taking delivery of a new mainsail. We got a quote from North Sails and from Precision Sails. The Precision quote was really good. Lots and lots of options and they were extremely responsive. We ultimately went with North Sail, because I’ve worked with the owner of the Portland location before and I like having him come out to measure up the boat. In the end, I guess I’m still hesitant about big purchases online or over the phone. We’ve gotten two sails from North already and loved both (headsails for Yanqui and our previous boat, a Montgomery 17). May 15, 2016 Postscript I’ve gone back and forth with used sails. I’ve had good luck with past boats buying “close enough” sails that were new, but cheap for whatever reason. The internet is a boon for that stuff, obviously, since you can just search by the dimensions you’re looking for. What I’ve come to realize is that my old thinking that “the new stuff just isn’t made as well” isn’t necessarily true. I’ve gotten some ridiculously cheap sails that worked perfectly, especially for what I’ve asked of them. And I’ve ended up sinking so much money into bargains that I have ended up spending more than if I’d bought something new. If I add in my own time spent coordinating it all, I’m sure I blow right past. And I’m 99.9% certain that long before I’ve figured any of this out, I’ll be dead already. Oh well. The bigger issue for me, and I think for a lot of boaters, is being realistic about what I actually need from a particular boat or piece of equipment. My headsail furler is a perfect example. I put a CDI Flexible Furler on our last boat. Cheap, simple, easy to install, and it did everything I asked it to. But Yanqui got me imagining trans-Pacific crossings, so I spent probably twice as much on a Harken which I’ve never asked to do any more than I asked of the CDI. All sailing the same piece of river. Which is ironic, since I think the Dolphin is the perfect size of boat; not so big you can’t solo, not so small you can’t bring someone along. The Columbia is filled with heavy displacement, deep keel ketches sailed by people with one eye half the time. At least I got my choice of boat right. Anyhow, I’ll be interested to read other people’s experiences with buying used sails. June 28, 2016. Jim Homet (Maggie, Yanke #233) and your webmaster had an exchange of emails regarding his 'solent' forestay. Here is the exchange. Back a few months ago Jim commented on his 'solent' stay - you can barely see it rising from the foredeck (just above the last registration number). These comments, and a webmaster reply did not make it to Maggie's page then but a subsequent comment from Jim on his 'solent' indicated a need to share them - they are below (minor edits). I sail single-handed a lot, and when racing I'm often either underpowered or overpowered. I don't have auto pilot so I need to speed up the process of changing sails. I plan on trying to run a solent stay to carry my Jib while the Genoa runs on the forestay. I had APS make up an Amsteel line with a low-friction ring spliced into the lower end. The solent will be connected permanently to the masthead fitting with a block off the stemhead fitting. This will allow me to tighten the solent to act as a stay when I need it, and then pull that back to the mast when I don't. The low-friction ring will allow a 2-1 advantage. The idea is in my head now, and I think it will work, but would appreciate any insight. My first reaction to your email was to look up solent rig - I had heard the term but never knew what it was - maybe you have seen this link? http://www.cruisingworld.com/how/two-headsails-are-better-one So, clearly I can't advise on it. Interesting idea to be able to pull the furled solent rig back to the mast - and an interesting, maybe complicated, system? My single handed perspectives have changed over the years. Initially, I had, still do, a reefable 140% genoa - with a line led back to the cockpit reeved thru a block at the stem head and ending at a higher tack grommet, maybe 3'? up the luff of the sail. The halyard is led back to a camcleat on top back edge of the cabin house. There is a double set of sheets - the lower set attached to the bottom clew, the higher set attached to a clew maybe 4-5'? higher up the leech. It worked - no need to go out on the deck - but I became less enamored with all the lines, and the baggy lower part of the sail - it did have a line of reef grommets that I never used. Nowadays, I pay closer attention to weather conditions/course, etc, and if there is any doubt I use my old Atlantic jib as a blade sail. This sail fits perfectly in the foretriangle and has a beautiful trimmed shape - as long as I'm going to weather. Its very stiff and a hassle to take down as it can't be stuffed in a bag, only rolled - not a singlehanders ideal set up. I have a small jib which is a joke going to weather but is sweet reaching. I may have missed a few comments - they are summarized, more or less, here - http://dolphin24.org/sail_comments.html and the links off that page. ps Pre website days, back in 2003, I think, my son and I left Cape Ann early in the morning, sailed thru the Isles of Shoals with whales breaching on our port side, dolphins jumping on our bow waves, spinnaker set, whale watching boats heading out from Rye at flank speed. We dropped our chute on entering Casco Bay just before dusk, picked up a mooring at the Dolphin Marina, South Harpswell, Maine. It was the best sail I ever had!! Comments from readers regarding their 'inner forestay"/Solent are encouraged. September 28, 2016. Jim followed up with these comments of the 'solent"
I have succeeded in finding a way to not rig the Solent stay. I had a spare mainsheet block setup that I attached right behind the forestay. It worked to tension the solent, but there was so much line everywhere that is was very difficult to use in heavy airs. The concept is still valid, but I think a single block has to be connected to the stem fitting and run through a bullseye back to the cabintop winch. That, combined with a retrieval line on the blade, will allow you to handle everything surrounding the solent from the cockpit. You would only have to go forward to douse the genoa. We are getting ready for another trans Winnebago race and the wind is predicted to be gusting to 27 knots at an angle slightly forward of the beam. With this angle of wind it will be too high to fly a spinnaker. Do you have any recommendations for sailing fast for 30 miles on a beam reach in 27 knots guests? This past weekend we were on a similar spinnaker beam reach with the breeze at 16-18 and gusts in the 20's. The helmsman and main sheet and spinnaker sheet trimmer worked hard together to keep Marionette from rounding up as she surfed down the face of 5-7' waves. This can be pretty scary. The helmsman usually had both hands on the tiller and when the surfing/gusts hit had to anticipate easing the boat to leeward - the traveller down to leeward and no playing the main. The windward shore is pretty shallow and closer to the finish. Do you think there would be any advantage to bring the board up and sailing along the windward shore hiding from the waves and some of the strong breeze? When racing around Block Island we often try and get out of dirty air from big boats passing, go inside and look for a more favorable breeze, or less wave/chop - sometimes lift the board and dare anyone to follow us into "Dolphin territory". Typically, this tactic works better when conditions are light and the breeze might 'lift' as it reaches the shore - especially if there are high bluffs. We have a 140% heavy genoa that we like to use in close reaching and stiff breeze. It has a 2nd tack higher up on the luff - maybe 2 feet, and a 2nd clew higher up on the leach. We lead the halyard back to the cabin top and rig a second set of sheets to the higher clew. We can go up and down with this set up as conditions permit/warrant. I feel like most of the boats will stay on the Rumbline the whole way I just don't see us having a lot of luck in 3 foot chop versus some of these bigger boats..... any advice would be greatly appreciated. Dolphins don't like chop and upwind work and excessive heeling is problematic - slow, have to 'ease off, longer course ..
Max Replies - Wow Ron that sounds like a rough race! Did you find problems with lee helm with the 140% and two reefs? Next time I am on the Sea Fox I will send you pictures of my traveler set up. Having a background in inland Scow sailing we alway play the traveler. Sea Fox has a traveler track behind the cockpit but the traveler is trimmed on both side of the cockpit forward of the helmsman. Thanks again for all the advice. I can't even beginning to tell you how helpful your web site has been to me over the years. I will send you pictures soon. Thanks Ron, I was also considering the use of a staysail as my mast is set up for it in combination with a 7/8th of the fore triangle jib. Any thoughts on this approach? I have no experience with a staysail on Marionette. I have had good experiences using a 100% 'blade' sail in heavy upwind conditions which are covered here. http://dolphin24.org/blade.html Most important is playing the main sheet traveller. Marionette's is set up so the traveller can be adjusted up or down from either side so the helmsman can ease and bring in the traveller from the windward side and keep the boat from too much heeling and having too much weather helm. August 22, 2017. 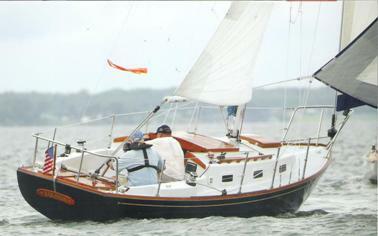 Marionette raced in the Camden Classic Cup/NE Dolphin 24 Championships July 27-29, winning both of her races. Marionette's crew was webmaster Ron, and his son Mike 'drove'. Post race conversations with crew of other Dolphins racing prompted Mike to write down some of the things he felt important to making a Dolphin go fast - particularly in the kind of kind of conditions we had - light/moderate/NO wind. Below are his 'first installment' comments (minor edits). It should be noted here that Mike, besides being a regular crew racing on Marionette over the past 20+ years, is a former Head Sailing Instructor, a former Collegiate All American sailor, a former I-420 National Champion, just to mention a few highlights of his sailing background. Set up: Reasonably smooth bottom but no special pre-race wash needed due to cold water in Maine. Shroud tension nominal, whatever that means (means webmaster set up - check out http://dolphin24.org/tuning_a_Dolphin24_mast.html) 170% genoa with leads set up two inches aft of the aft face of cabin, sheet evenly bisecting the leech and foot edges of the sail. 1. Write course down on paper and use chart to determine compass heading between all marks: know where you are on course and be able to find your next mark. 2. Look far upwind and out to the sides of the course, identify wind strength differences: sailing in the most wind velocity on course is top priority. If a land breeze will be replaced by a sea breeze, make a deliberate choice about where you want to be when the new breeze comes in. Usually a strong sea breeze will fill everywhere and you want to get it first; in light breezes a battle can last for hours during which the best wind may be closer to land - and you need to avoid the dead zone in between. 3. Look at the weather forecast and understand the overall pattern and what wind strength will be across the duration of the race. Sail upwind. Confirm or change jib/genoa and mainsail reefing, if any, based on heel and speed, factoring in what conditions will be like during first leg (first hour) of race. 4. Do a wind shot, is the forecast accurate to where you are sailing? Sail upwind on both tacks and note the compass course and mark arrows on chart with the wind direction and time of day. Plan first leg based mostly on visible wind strength but with consideration of direction and predicted change in direction. Rule of thumb: sail the long tack first. 6. Plan your start so that you are on the favored half of the line and can implement a game plan to go the direction you want to go. Are you planning to go on a long starboard tack after the start to get toward the left side of the course? Don't start with a boat close to leeward! 7. Assess the current and make adjustments to your start and first and second leg plan. Look up low and high tide times and try to understand how current directions are in the area, perhaps talk to locals. In light conditions especially, remember that when your boat moves in current an equal and opposite direction wind vector combines with the true wind direction and your forward motion. Next installment would be some ideas about keeping speed during the race. I bought a new loose footed main from Peake Sails (far east). You can see the loose foot in the Equinox gybe mark photo from the 2016 Turkey Shoot. They put the Yankee Yachts emblem on the sail and not a Dolphin. The loose foot was recommended as you can adjust the shape of the foot. Flatter seems to work better as wind speed increases. I sail with the old main except when racing. It's been O.K.